In 1861, John Gregg and Hiram B. Granbury enlisted with the 7th Regiment Texas Infantry for "Three years or the war." As their wives followed them from battlefield to battlefield, and eventually to prison, they skillfully commanded the Confederate forces. The story of Gregg and Granbury is one of generals in love and in war. In 1858 in Morgan County, Alabama, John Gregg and his bride, Mary Francis Garth, stood before a magistrate and repeated their vows, "In sickness and in health - Till death do us part." Following their marriage, the couple left for Fairfield, Texas, where Gregg served as District Judge. He also founded the first newspaper in the county, the Freestone Country Reporter. In that same year, March 31, 1858, Hiram B. Granbury, a former Mississippian who had moved to Waco in the early 1850s, stood with his 20-year old bride, Fannie Sims, formerly from Alabama, and repeated the same vows. Hiram Granbury served as the chief justice of McLennan County, Texas. During the early years, he had helped to establish the newspaper in Waco. In 1861, after Texas seceded from the Union, John Gregg organized the 7th Texas Infantry, a group of 746 men recruited from nine East Texas counties. That same year, Hiram Granbury formed the Waco Guards that would soon become a part of the 7th Regiment Texas Infantry. In the fall of 1861, both men, still in the honeymoon years of their marriage, left Texas to fight in the war. In February of 1862, the 7th Texas and other Confederate regiments were captured at Fort Donelson, Tennessee, and John Gregg and Hiram Granbury were taken prisoner. Stunned over the turn of events, Granbury and a friend, Capt. K. M Van Zandt, decided to approach General U. S. Grant to make several requests. First, they requested that Colonel Clough (killed in action) be given a proper burial. Secondly, they requested that Col. Granbury be given some time before being taken prisoner in order to settle his wife, Fannie. During the early months in Hopkinsville, Fannie had been the houseguests of the Steven Trice family, supporters of the Confederate cause. However, in 1862, when the epidemic of measles began to spread throughout the camp, Fannie moved to Clarksville, Tennessee, a distance of some twenty-five miles. General Grant listened to Granbury and Van Zandt's petition and surprised everyone by granting both requests. As Granbury traveled to Clarksville to make plans for Fannie, Mary Gregg paid for a train ticket and took the train to Decatur, Alabama. At first Granbury and Gregg were imprisoned at Fort Chase in Columbus, Ohio. However, on March 6, 1862, they were moved to Fort Warren Prison in the Boston Harbor. Fannie rode the train from Columbus, Ohio to Boston, Mass. with the soldiers. However, after arriving at the Boston train station, she was not allowed to accompany the prisoners out to Fort Warren, an island six miles from Boston. Thanks to the kindness of Granbury's cellmate, Dr. Charles McGill, a physician, Fannie was taken in as a house guest of Mary McGill in Hagerstown, Mass. During her stay with the wife of Dr. McGill, Fannie began to experience problems with abdominal swelling. In July of 1862, she made an appointment to meet with a physician in Baltimore for exploratory surgery. Granbury was released from prison [prisoner exchange] in order to attend the surgery. A letter to Col. J. Dimick, U. S. Army, Fort Warren, Boston, documents Granbury's early release: "Washington, July 29, 1862. The eight or nine prisoners referred to and those who have taken the oath of allegiance will not be sent to Fort Monroe; Parole Major Granbury, of Texas, that he may attend his wife having a surgical operation performed at Baltimore, then to report to General Wool, in Baltimore. L. Thomas, Adjutant-General." The outcome of the doctor's appointment was never made known. Hiram was released from prison on July 30, 1862 and was reunited with Fannie in Baltimore. The couple immediately made plans to board a steamer and travel to Richmond in order for Hiram to await prisoner exchange. During this time, Hiram became fully aware of the severe situation that existed with Fannie’s health. Whether or not Fannie was ever examined by a doctor or not is unknown but she apparently suffered with ovarian cancer, an illness that would take her life within the year. After the prisoner exchange was completed in Richmond, Hiram returned South for the reorganization of the 7th Texas in Jackson, Mississippi. En route, he left Fannie in her home state of Alabama were she could be cared for by family. 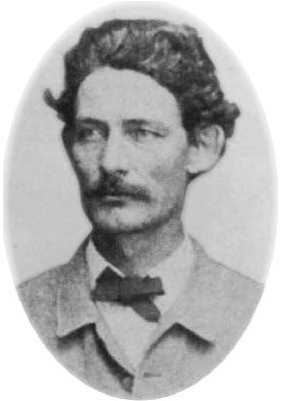 During the re-organization, Granbury was promoted to the rank of colonel and sent to Texas on recruiting duty. Gregg was also exchanged from prison and promoted to brigadier general on August 29, 1862. At this time, he was given command of a brigade consisting of: 1st Tennessee Battalion, 7th Texas, 3rd Tennessee, 10th Tennessee, 41st Tennessee, 50th Tennessee, and Bledsoe’s Battery. Granbury and Gregg continued in the war and were eventually sent to Port Hudson, Louisiana, to defend the Confederate position along the Mississippi. During this time, on March 20, 1863, Fannie passed away in Mobile, eleven days before what would have been their 5th wedding anniversary. Hiram took a leave of absence in order to be with her at the time of her death. On March 21, Fannie’s obituary appeared in the Mobile Advertiser and Register: “Died on yesterday at 11:00 a.m., Mrs. Fannie Granbury, aged 25 years, Wife of Col. H. B. Granbury, 7th Regiment Texas Infantry. The funeral will take place from Providence infirmary at 3 o’clock P.M. TODAY.” Unable to afford a headstone, Hiram buried Fannie in Magnolia Cemetery in an unmarked grave. 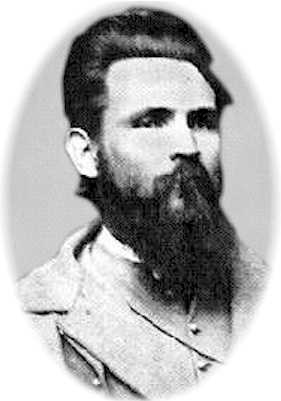 After Port Hudson Gregg’s Brigade, including the 7th Texas, fought in the Battle of Raymond, the Battle of Chickamauga, the Siege of Chattanooga and the Atlanta Campaign. On September 19, 1863, Brig. Gen. John Gregg was severely wounded during the Battle of Chickamauga and was taken to a Confederate hospital in Marietta, Georgia. Once again, Mary Garth traveled to be by his side and to assist with his recovery. This was perhaps one of their last chances to be together in life. One year later, Oct. 7, 1864, while fighting in Virginia, Brig. Gen. John Gregg was killed. His marriage had lasted less than six years. Mary Garth heard the news of her husband's death while staying at her father's plantation in Alabama. "Her soul was plunged in grief beyond all other grief," friends recalled. After several months of grief and depression, Mary Garth decided she could not rest until she traveled to Virginia to claim her husband's body. Traveling with Sgt. E. L. Sykes, a Confederate soldier and family friends, Mary left on January 18, 1865, to reclaim her husband's body. They arrived in Virginia a month later but overwhelmed by the experience, Mary Garth succumbed to a nervous breakdown. They had to wait weeks before she could recover enough of her strength to make the long journey back. In April of 1865, Mary Garth Gregg finally arrived in Aberdeen, Mississippi, where she laid her husband to rest in the Odd Fellows Cemetery on the outskirts of town. Like Brig. Gen. John Gregg, a friend in love and war, Brig. Gen. Hiram Granbury, also went to his death a hero. He was killed Nov. 30, 1864, during the Battle of Franklin. Witnesses of the blood bath at Franklin reported, "General Granbury was hit in the eye about the same time Gen.Patrick Cleburne was hit in the chest. The bullet passed through his brain and exploded at the back of his head. He threw his hands up to his face and fell dead instantly." Granbury was initially buried near Franklin but later his body was reinterred at St. John's Episcopal Church cemetery, Ashwood, Tennessee. In 1893, his body was once again moved - this time to Granbury, Texas, a town named in his honor. A lonely, unmarked grave in Mobile and a faded obituary are all that remain of his beloved Fannie. Of the foursome in love and war, Mary Garth Gregg was the only one left. She remained in Aberdeen, Mississippi, where she could be near her husband's grave. For the remaining thirty years of her life she never left the town where her husband's remains were interred. When Mary Gregg died in 1897, she was buried next to her famous husband. Her tombstone reads, Mrs. General John Gregg. Sources: Force Without Fanfare, by K. M. Van Zandt and edited by Sandra L. Myres, published by Texas Christian University Press, 1995 (http://www.prs.tcu.edu/prs/); Letter from L. Thomas, Adjutant-General to Col. J. Dimick, U.S. Army, Fort Warren, Boston, dated July 29, 1862; Official Records of the Civil War; Compiled War Records from the State of Texas, Harold B. Simpson History Complex, Hillsboro, Texas; Cemetery Records of Mobile; March 21, 1863 Obituary of Fannie Granbury from the Mobile Advertiser and Register; An Account of the Burial of Gen. John Gregg in Mississippi, 1865, by E. L. Sykes, Aberdeen, Mississippi; Autograph Album of Col. John Towers, 8th Georgia Volunteer Infantry (prisoner at Ft. Warren); Lone Star Generals in Gray by Ralph Wooster; 1858 McLennan County Marriage Records, Intrepid Gray Warriors by James Newsom (PhD Dissertation from Texas Christian University on the 7th Texas Infantry). Assisting Rebecca Drake in researching this article were: Jane Embrose, Ashland, Ohio, descendant of the Granberry family; Mary Eddins Johnson, professional genealogy researcher from Mobile; and Edward Lanham, Atlanta, Georgia, Civil War researcher. For source information and more details regarding this article visit http://www.battleofraymond.org or http://www.raymondms.com.